Two years ago today the reservoir was officially closed. With a lot of hard work we’ve come a long way. Thanks to Loudoun Water for working with the community to share such a valuable resource. 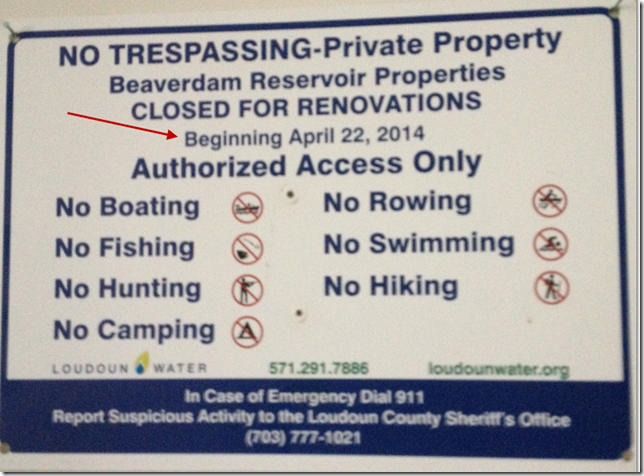 Beaverdam Reservoir, owned by Loudoun Water, is first and foremost a source of public drinking water. Loudoun Water has partnered with the Northern Virginia Regional Park Authority (NOVA Parks) to manage recreational activities and public access until the spring/summer of 2017. At that time it will close to complete needed repairs to the infrastructure. After repairs are complete, expected to take approximately 1.5 to 2 years, the property will reopen for public access under the management responsibilities of NOVA Parks.